Public outrage over official corruption was one of the main reasons for the wave of protests in 2010-2011 that led to the overthrow of Tunisian President Zine el-Abidine Ben Ali. Just one day after Ben Ali’s departure, the provisional government established a National Commission of Enquiry into Misappropriation and Corruption (Yerkes & Muasher, 2017). Laws and other mechanisms were adopted to try to tackle corruption, including the 2014 Constitution, which aims at addressing bad governance and corruption; the framework for Prime Minister Youssef Chahed’s government, which lists fighting corruption as its third priority; and a whistle-blower protection law. Yet a report of the National Commission of Enquiry into Misappropriation and Corruption revealed in November 2011 that corruption had increased at many levels of state institutions and society (National Strategy for Good Governance and Fight against Corruption, 2016). National and international reports and studies confirm the commission’s revelations. The 2017 Corruption Perceptions Index ranks Tunisia 74th out of 180 countries, an insignificant change from 73rd in 2011 (Transparency International, 2018). Afrobarometer survey findings paint a similar picture. Tunisian citizens say corruption continues to increase, and they consider it the third-most-important problem that the government needs to address. 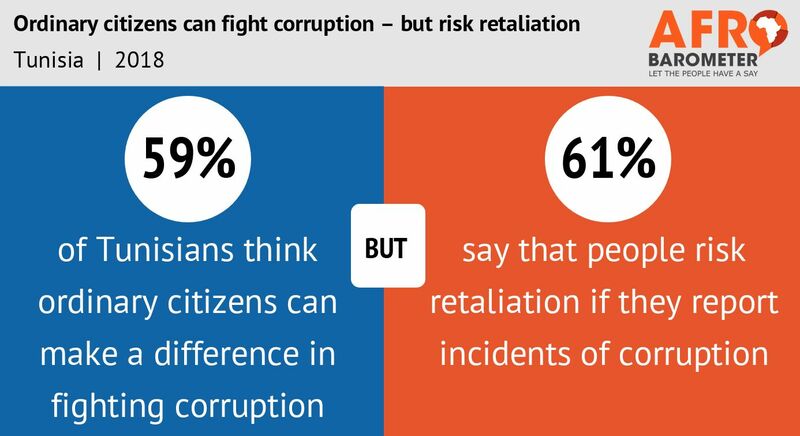 However, to a large majority of Tunisians, the government is performing poorly in its fight against corruption.